Avenues 2009, the annual two-day business festival of the Shailesh J Mehta, School of Management, IIT Bombay, based on the theme 'People, planet and profit' reflected the creative and intellectual spirit of the management students. It was a great experience for the management students to organise the events, get sponsors and run the show smoothly and live up to the expectations of the participants. "As management students, we are masters at case studies. But, the practical aspect is never checked. Organising events of such scale helps us put these principles in practice. It gives us a test field to implement our ideas and check what works and more importantly, why it works, like marketing the event on social networking sites," says Amey Kambli, second year student at SJMSOM IIT Bombay, event coordinator of Avenues 2009. 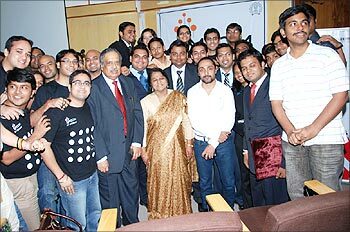 Image: M. Damodaran, former SEBI chief, Karuna Jain, Head of SJMSOM, Rahul Bose, actor with the students. Successful entrepreneurs and outstanding achievers from different walks of life participated in the event. M.Damodaran, former SEBI chief; Ajit Balakrishnan, founder and CEO of rediff.com; Pramod Chaudhari, chairman, Praj Industries; Ness Wadia, joint managing director, Wadia Group; Rahul Bose, actor, and Prahlad Kakkar, advertising guru addressed the students during the event. The event also saw participation from students of more than 150 B-schools across India as well as leading corporate houses and working professionals. Starting off the guest lecture series called Alankar, Ajit Balakrishnan, founder and CEO, rediff.com, delivered a thought-provoking speech. He talked about the digital revolution, the threats and opportunities for India. "India will lose its way in the online digital revolution just like it did during the industrial revolution if the government does not take proactive measures to make broadband cheaper and easily accessible," he said. Avenues 2009 saw active participation from B-school students on various events like: a HR event, green project financing, Pune infrastructure consulting challenge, social marketing event and such other novel concepts. "These ideas were well-received by the B-school community and we got over-whelming participation. An innovative concept of collaborative green IT strategy was slightly ahead of time. The event execution was smooth with the support from public relations and logistics teams," Amey said. Image: Ajit Balakrishnan, founder and CEO of rediff.com. 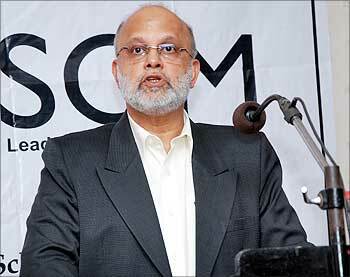 Pramod Chaudhuri, chairman, Praj Industries, spoke on the theme 'People, planet and profit'. He spoke about the triple bottom line principle, which considers that besides economic aspects, businesses should look toward the environmental and social aspects to ensure true sustainability. He touched upon climate change, the greenhouse effect and other environmental issues. He said the underprivileged must be educated for the world to sustain itself. He also highlighted the need for more entrepreneurs to build innovative and sustainable solutions for the world. "The experience of organising the event was like steering a startup to attain new heights. As the event coordinator, I was the first person elected by the batch for the job. Encouraging healthy competition between teams and resolving conflicts were my top priorities. I had a bird's eye view of the festival and so I had to steer individual teams in the right direction when they would lose focus. The team of three coordinators who shared my responsibilities ensured that I did not take a biased decision," Amey added. Image: Pramod Chaudhuri speaks at Avenues 2009. M Damodaran, former chief, Securities and Exchange Board of India, gave an insightful talk about regulations. He said that as long as fear and greed define human conduct, there will always be a need for an external body to list what is fair and unfair, right and wrong and this is what makes up a regulator. Damodaran spoke on the situation in America and how the present methods to combat the recession might not really be helpful in the long run. He spoke of India's own method to use regulation to solve problems and said that this could not really work. After all, if a crime is committed, one punishes the criminal; one doesn't rewrite the law. This principle should also apply in the financial world in the case of scams and frauds. 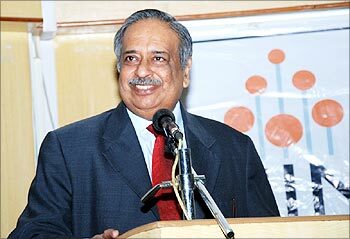 Image: M. Damodaran, former SEBI chief at Avenues 2009. 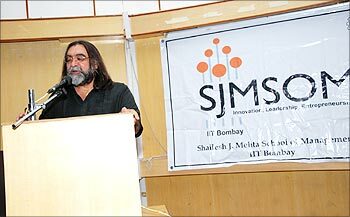 Ad guru Prahlad Kakkar had the entire audience laughing with humorous anecdotes from his own experiences. Kakkar used various incidents in his life to explain the his principles. He said that for most people, the greatest motivation in their lives is fear and that fears have to be confronted, not shelved away. Kakkar illustrated this by describing his first diving experience when the great fear of the open ocean forced him to confront all his other, smaller fears. Kakkar went on to speak on the issue of global climate change and how it affected unrelated victims even more than perpetrators. He illustrated the devastating effects of climate changes, such as the destruction of marine life and the possible submerging of coral islands. He believes that, the issue of climate change should be solved by every nation resolving to clean up its own house first and then seeking responsible behaviour from others. 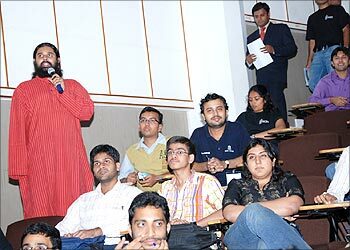 Image: Ad-Guru Prahlad Kakkar at Avenues 2009. Well known actor and social activist Rahul Bose conducted a very interactive and thought-provoking session, which was an enriching experience for the students. He spoke about how to be 100 per cent happy. Firstly, we should find out who we are, by finding out the values that we hold dear. Next, we should determine what it is that we are born to do and then find a way to do it. Then, we should take away or reduce the things that make us unhappy by giving our time, skill or money, but not to such an extent that it hurts. Image: Rahul Bose shares his thoughts at Avenues 2009. Ness Wadia, who was the judge at the flagship consulting event -- Samvaad, interacted with the students and enthralled everyone with his very real take on corporate social responsibility and the lack of it in the Indian corporate domain. He also addressed current issues of social development and the need for public private partnership in various fields. Wadia took very keen interest in the overall proceedings and asked relevant questions to all the participants. His feedback and comments were invaluable for all the participants. 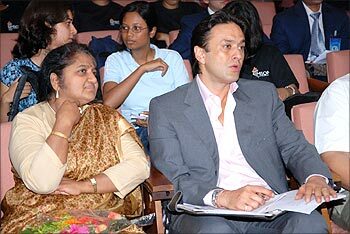 Image: Ness Wadia with Karuna Jain, Head of SJMSOM, at Avenues 2009. The HR event called HRiday, saw the participation of more than 100 teams from the best B-schools in India. Opera, the operations club of SJMSOM conducted Yojna, a case study based operations event. Another interesting project was Imagine it! Participants were given some materials like candles, used CD, straws and matchbox and asked to make a useful thing from it. There were lot of innovative ideas and products presented in this event like - solution for electricity scarcity in Mumbai, multi-utility organizer etc. Around 100 teams participated in preliminary round of Pragyaan, the business Quiz. Participants were from the corporates such as IBM, Sun, Deutsche Bank, Tata Consultancy Services and from institutes like IIMs, the SP Jain Institute, etc. 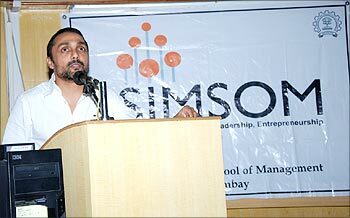 Avinash Mudaliar, CEO of 3XUS was the quizmaster. Image: Participants ask questions at the event. Navonmesh, the entrepreneurial challenge, gave fillip to the spirit of innovation and enterprise in the country. This event conducted every year aims to offer a helping hand to support and nurture start-ups. Six start-ups were invited to present their business plans. These start-ups are supported by the Technopreneur Promotion Programme of the department of science and technology. The start ups presented feasible business plans to a panel of judges, which included start-up owners and venture capitalists. Karteek Narumanchi, Aravind Venugopalan and Rajesh Kumar Naidu Yabaji from IIT-Kharagpur won the award this year. P2 Power, owned by Shwetank Jain, is a start-up currently incubated at IIT Kharagpur and has products to improve the power distribution quality. P2 Power Solutions aims to be a market leader in the domain of power quality enhancement at the distribution level, helping industries to strengthen their power assets through avant-garde technology and technical expertise. The event was a culmination of months of hard work for the second year students of the SJMSOM. "The event plans were initiated in March when we brainstormed on the theme for the festival and the events. We started working on the events three months ago when we approached distinguished personalities for lectures and corporates for sponsorship. The economic slowdown made getting sponsorship an uphill task. 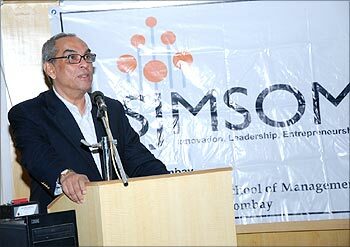 But our marketing skills and the brand name of SJMSOM, IIT Bombay helped us pull it off in grand style," says Amey. Image: SJMSOM students at the event.